It's been almost a year since the Kindle Fire HD was announced, so it's about time the Amazon tablet had a bit of a refresh - and that could well be on its way if some new benchmarking data is to be believed. Now, you can't always believe a benchmark - bear that in mind - but the data in question relates to a product referred to as Amazon KFAPWA which, when you take the specs into account, is likely a new Kindle Fire HD model. Those specs include Android 4.2.2, a Qualcomm Adreno 330 GPU (which, in turn, implies a Qualcomm Snapdragon 800 processor) and a resolution of 2560 x 1600. Given that the current 7-inch tablet rocks 1280 x 800 resolution, while the 8.9-inch Kindle Fire HD is 1920 x 800, it's a boost no matter what size tablet we're looking at (although the smart money's on the 8.9-inch model). Amazon gave the current Kindle Fire line-up a bit of a price chop last week, which sparked a flurry of rumours that a new batch was incoming. Will Amazon follow the crowd and announce its new tablets at IFA 2013? We'll be at the show to bring you all the news as it breaks. 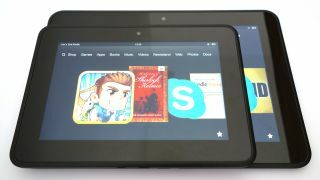 What else do we know about the new Kindle Fire HD? Find out here.